Father's Day is always the third Sunday in June. Father's Day honors the role of dads and men who serve in father-like roles in the lives of others. Fathers, grandfathers, stepfathers, fathers-to-be all have a day to stand in the spotlight on Father's Day. As "non-traditional" family structures become more common, any nurturing man – "big brothers," brothers-in-law, uncles, neighbors and others who are "like a father" – is likely to be honored on Father's Day. 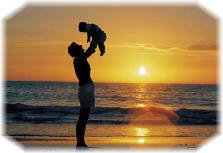 Father's Day originated in 1909 when a woman named Sonora Dodd came up with the idea. Mrs. Dodd's father, William Jackson Smart, had raised her and her five siblings after their mother died in childbirth. While listening to a Mother's Day sermon at a church near her family's home in eastern Washington State, Mrs. Dodd thought about the sacrifices her father had made for his children and the fine job he had done in raising them. Because her father had been born in June, she decided to encourage the churches in her area to honor fathers in June. Through her efforts, the first Father's Day was celebrated in Spokane, Washington, in June 1910. Although Congress passed several resolutions over the years in support of Father's Day, it did not become an official U.S. holiday until 1972, when then-President Nixon issued a proclamation declaring the third Sunday in June as Father's Day in the United States.